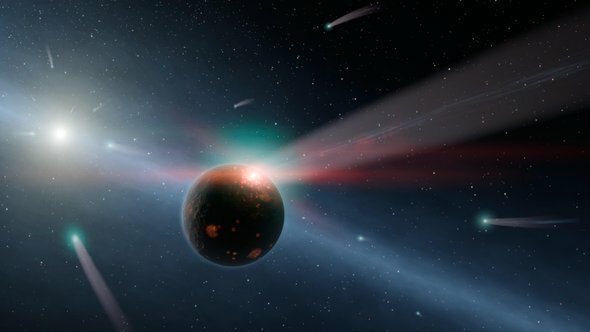 A rain of comets is pouring down on a faraway young star, giving astronomers a new view of a process that shaped our own solar system billions of years ago. When Earth was a young planet, cometary debris battered its surface, carrying organic material that may have helped life arise on our rocky world. In recent years scientists have spotted indirect evidence for a similar process around Eta Corvi, a solar-type star some 59 light-years away that is slightly larger and three times younger than our own sun. Now newly observed flickers of gas thought to emanate from comets evaporating in the heat of the star are providing stronger evidence for both hidden planets and cataclysmic impacts.